Family: Bignoniaceae Origin: Native to the tropical, dry forests of Western Africa. With their flaming red flowers, African Tulips Trees have been popularly used as ornamental plants, decorating the suburban streets and gardens of Australia’s tropical and subtropical regions. However, they have become a serious, invasive threat in Northern Queensland and are beginning to impact upon Southern Queensland as well. African Tulip Trees are highly attractive to bees, birds, bats and butterflies that feed on the trees’ vast quantities of nectar. They establish easily, are fast growing and have multiple forms of self-propagation. The trees flower profusely and begin doing so when they have achieved as little as 1 metre in height, even while indoors or planted in a container. They will not survive in cold climates and can drop leaves suddenly if temperatures fall below average. 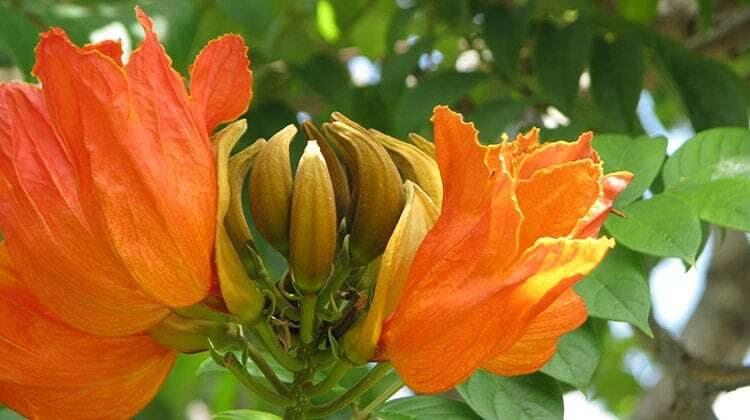 African Tulip Trees are capable of growing up to 24 metres. They are an upright tree with a wide, spreading canopy and can crowd out other forms of vegetation if left unmanaged. A soft-wooded evergreen, they sometimes develop twisted or lopsided due to their various, easily broken branches. African Tulip trunk showing an inclusion of bark. Very established trees will develop a slight buttressing at the base. 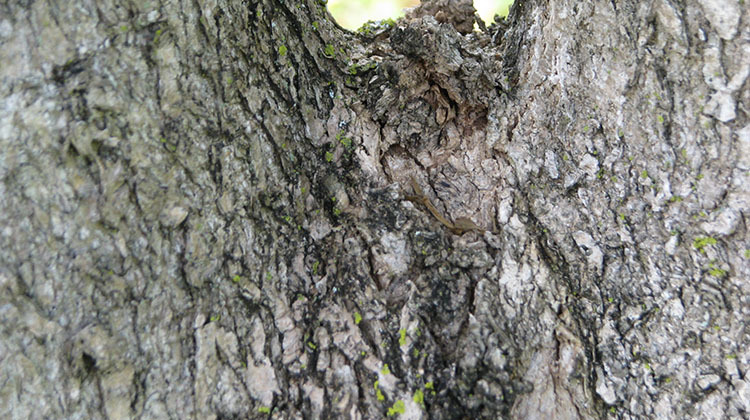 The bark can be marked with small white lenticels. Dense clusters of large, inflorescent, scarlet-coloured flowers have made these trees a favourite for gardeners. The flowers appear after the trees’ distinctive horn-shaped calyx tubes split reveal 10-12cm long, slightly cup-shaped petals with soft ragged edges. The flowers are spectacularly coloured with shades of brilliant red, tending to orange. The tree will flower throughout the year, with more intense coverings during the springtime peak season. The trees are also decorated with 15-20cm long seedpods. These flattened, green capsules grow in clusters and turn reddish-brown before they open to spill around 500 winged, papery seeds each. 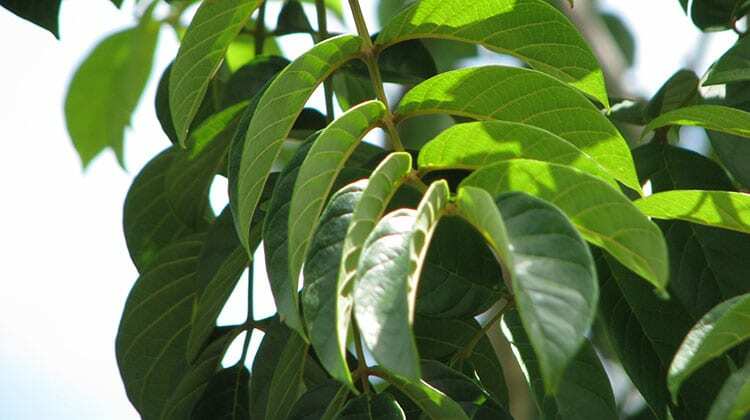 Large, pinnate leaves measuring up to 50cm with a collection of 7-17 broad, oval leaflets per pinnate. Dense foliage, especially in the crown, which can stretch to over 12 metres across. The African Tulip Tree produces a woody fruit with a poisonous centre. It is said that as a traditional hunting methods Africans would boil the fruit and extract the plants’ toxins, which they then used to dress the tips of their arrows. The wood is soft and branches that break from the trees during rain and storms readily establish themselves as new seedlings where they fall. The tree can be propagated from herbaceous cuttings or from dried seed if the pods have been protected from frost. Stumps from these trees sprout root suckers so unwanted growth may appear if trees are not removed properly. As the tree’s main method of spread is wind-dispersed seed, where practical, juvenile pods should be removed to prevent further reproduction. Drought tolerant, they can grow in dry, tropical forests but prefer moist locations such as creek-laden gullies where watered, rich soil can be found. Sheltered ravines are the ultimate environment for African Tulip Trees where they spread to fill the landform. In sandy, coastal areas they tend not to reach full height and can be more easily managed. Relatively easy to grow and quick to produce colour in the garden, they often start as an initial joy for home-owners but, depending on where they’re planted, can become a high-maintenance pest later on. Most of the problems involve the messiness and ongoing clean-up requirements of keeping the tree. The flowers litter the ground, pods and branches fall, sudden leaf drops clog gutters and along with other nectar-loving fauna, the tree can bring ants. When the nectar in African Tulips ferments in becomes toxic to Australian bees, killing them. Since native bees are an important pollinator of Australian native flora, African Tulips have a terrible impact on Australia native trees. African Tulips should not be propagated and should be removed completely from the Australian urban landscape. You write above: “native bees are an important pollinator of Australian native fauna”. “Fauna” means animals, so they can’t be pollinated. The correct term for plants is “flora”. Hi David, I have two African Tulip trees on my property in norther Brisbane, and they are a truly beautiful tree with lovely flowers. Unfortunately, I will be removing them in the next couple of because of the native bee issue. There are so many native bees around, and they don’t stand a chance when they enter the flower. There is evidence of dead bees inside the flowers when they drop to the ground. I have an African Tulip Tree growing beautifully beside my garage. My new neighbour asked me a few weeks ago if he could cut down two branches that overhang his pool. I had no problem with that though also, did tell him that I was planning to have it chopped out anyway. I do want to chop it out, despite the beautiful coloured flowers, however; I would like to use an organic poison that will be non toxic to the rest of my garden. 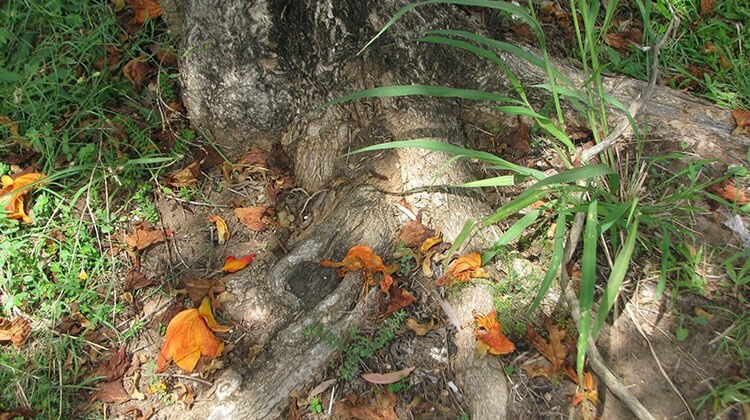 Council have a African Tulip outside my home, the roots have damaged my bathroom floor, my stormwater drains and now my sewer lines and Brisbane City Council refuse to remove it, This tree has cost me a lot of money however that is no concern to BCC. Any suggestions ?